After the recent fourth parliamentary elections were held, that is, after the two political parties that paid only lip service as royalist were handed the most shameful defeats at the polls on 27 July 2008, a number of royalties have walked out of the political scene in order to hide their shame and disgust. Among the royal family members who had announced their departure from politics and who were so shamefaced and humiliated that they no longer dare to re-enter the political scene are Prince Norodom Sirivuddh and Princess Norodom Vajjara. And recently, Prince Norodom Ranariddh, former president of the FUNCINPEC [National United Front for an Independent, Neutral, and Peaceful Cambodia] Party, also publicly announced his decision to quit politics, preferring to devote his time helping to handle the affairs of his half-brother, King Norodom Sihamoni. Prince Ranariddh was sentenced in absentia by the Phnom Penh Municipal Court to spend 18 months in prison as of the day he is arrested and to pay $150,000 to the FUNCINPEC Party through its Secretary-General Nhoek Bun-chhai. Finding himself in an impasse before, Prince Ranariddh then resorted to a political solution. After the 27 July elections Prince Ranariddh announced his refusal to form any political alliance with the Sam Rainsy Party under whatever circumstances. Prince Ranariddh, then head of the Norodom Ranariddh Party [NRP] fleeing into exile in Malaysia to dodge the court's arrest warrant, voiced his recognition of the polls' results and even urged the Cambodian People's Party [CPP] with Hun Sen as its vice president and prime minister candidate to form a coalition government with the two-seated FUNCINPEC Party as soon as possible to avoid the same political deadlock as in the 2003 third general elections. Sources among the NRP officials said that after being granted royal pardon Prince Ranariddh immediately announced his divorce from politics and offered to assist the king in handling his affairs. His Majesty King Norodom Sihamoni then appointed the prince to the post of chairman of the Supreme Council of the King without waiting for any recommendation from Prime Minister Hun Sen. The sources said the king just signed a royal decree appointing Prince Ranariddh by himself last weekend. According to the same source, Prince Ranariddh is asking the minister of the royal palace [Kong Sam-ol] to officially appoint dozens of his aides so that they would have their own offices and positions inside the Royal Cabinet. These aides, it was said, are the same men from the sycophant entourage of the prince when he still was NRP president. Observers said that although Prince Ranariddh used to announce that he would abandon or end his political career he some times appears to still bear great influence over the NRP, keeping it at his beck and call. Moreover, although the NRP has already been handed to Chhim Siek-leng to lead as its provisional president, Chhim Siek-leng is just a nominal party president. All the important leadership decisions, it is observed, is made by Yu Hokkri, secretary-general of the NRP and MP for Kampong Cham constituency. 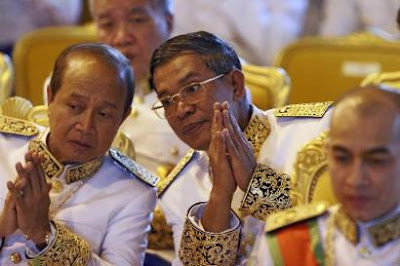 It is also said that Yu Hokkiri is running the NRP together with Sau Rani, another confidant of Prince Ranariddh and MP for Prey Veng constituency of the current fourth National Assembly.The same source further disclosed that after Prince Ranariddh announced his retreat from politics and became very cozy with Hun Sen and other CPP officials, the prince immediately asked for the inclusion of a number of NRP officials, his closest underlings, into the corps of government advisers and advisers of various national authorities. Those peeved for failing to get the advisory jobs left the NRP and defected to the CPP. Some of them were then appointed undersecretaries or secretaries of state while others were made government advisers. This fourth government is completely led and controlled by the CPP although the FUNCINPEC Party with its two seats has been made its partner in the coalition government and the NRP its partner in the National Assembly. These two satellite parties have not received any important posts in either the government or the National Assembly, not even as members of the National Assembly's specialized commissions. It is only after they submitted applications through the offices of National Assembly Speaker Heng Samrin that the MPs from the FUNCINPEC Party and NRP were included among the members of the House's specialized commissions and were given a bigger salary than the MPs without any posts in the nine specialized commissions of the National Assembly.